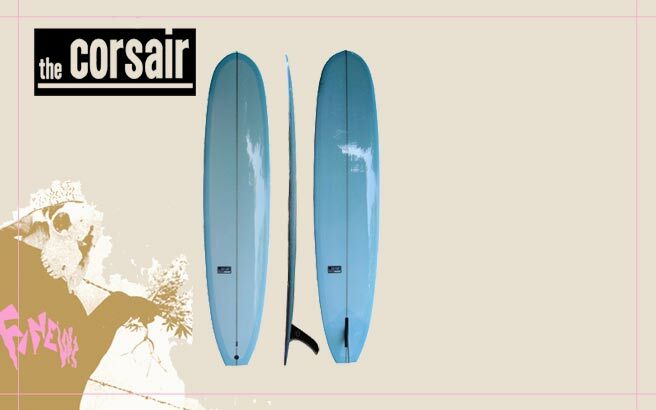 The Corsair is a design based on late sixties "high performance" models, with added nose for modern pose sensibilities. It's narrow, for easy and sensitive trim adjustments- most of the template curve is in the tail, where it's needed for quick direction changes, while the front end is straight for serious trim. A steerable nose rail and a flow-thru concave give good nose time; generous rocker and a 60/40 rail make it forgiving. This board is a great classic style rider for lighter weight humans. Fins always make a difference; two of my favorites are a Nat Young 9.5 or a Heritage 9.75.